The Rose Tearoom offers the perfect place to sit and relax over a cup of tea or coffee while enjoying the beautiful local vista, with views towards the sea and a glimpse of Malin Head in the distance. We offer a selection of home baked scones, cakes, tray bakes and light lunches; including sandwiches, wraps, panini and home made soups. Whether its a fresh ground coffee, latte or tea in a china cup that you prefer, our drinks menu will have something for you. We also have a Breakfast Menu that is served until noon. 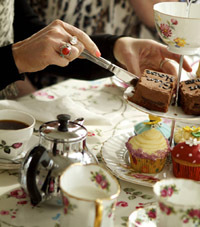 Our Afternoon Tea is ideal for a little treat or when celebrating a special occasion. During your visit to The Rose Tea Room why not take a browse through our downstairs rooms where you will also fined beautiful art works on display. These pieces are all by local artists, with the majority of the display by our resident artist Tess White. A few steps across the garden will find you at the starting point for the stunning National Loop Trail walks through the Urris Hills. Weather permitting you may prefer to sit on the decked area as the river from the Glevevin Waterfall flows past.